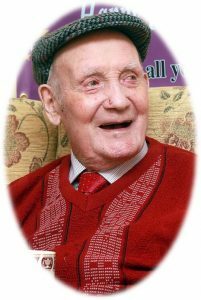 Keenan Patrick (Paddy), Fivemiletown died peacefully in his home on the 8th September 2018 surrounded by his loving family. Husband of the late Alice. Father of Kathleen (Cassidy), Gerry, Sean, Patrick and Peter. Paddy will leave his late residence 104 Main Street, Fivemiletown at 10.15am on Monday 10th September for 11am requiem mass in St Mary’s Church Fivemiletown, burial afterwards in adjoining Cemetery. House private. Family flowers only. Donations in lieu of The repair fund St Mary’s Church Fivemiletown. Deeply regretted by his loving Daughter, Sons, in-laws, grandchildren and entire family circle. Sacred Heart of Jesus have mercy on his soul.